The timing couldn’t be better: Cocktails haven’t been quaffed with such gusto in half a century. Prohibition-style cocktails continue to take on renewed relevance. Retro-frozen beverages showcase bitter, sweet, and sour aspects of farmers market produce. Shrubs—a distinctive vinegar-based mixer historically used in the Colonial era to preserve fruits—infuse particularly intense flavor. At this rooftop soiree, cocktail ice pops feature garden-foraged herbs and fronds. Mescal, which is booming in popularity, and spicy infusions add smoky depth. And floral elixirs and a large-batch cocktail served in an ornate punch bowl round out the perfect summer sundowner in the city. Serving a ruby-hued liquid studded with sliced strawberries and limes is Erin Hawley, MG Road drinks specialist. “Punches are really having a revival,” she notes. Long a Southern garden-party stalwart, punch has been appearing in bars across the country. “For an outdoor party, it’s the perfect batched cocktail,” Hawley explains. “It’s pretty, and all the prep can be done ahead of time.” The drink’s fruity appearance belies its bracing smokiness, provided by mescal and blanco tequila. This is a mature punch—citrusy, earthy, and tart, giving off the heady scent of a basket of fresh strawberries. Speaking of retro, Spencer Schultz, the bar manager of the farm-to-table Rhubarb restaurant on Pack Square, arrives with a cooler full of jam jars. The frosty pastel gems have been chilling on dry ice that maintains a steady minus 109°F. With his mixologist’s magic wand—an elegant stirring spoon—Schultz works the frozen beverages into the perfect slushy consistency of a frozen daiquiri. Basil, rhubarb, and blood orange, plus simple syrup and white rum, round out this recipe. “The frozen daiquiri is the quintessential simple cocktail,” says Schultz. For a modern twist, he appropriated a technique developed by Dave Arnold of Booker & Dax food and drink research lab in New York. A day ahead, Schultz had batched out the daiquiris into jars and placed them in the freezer. 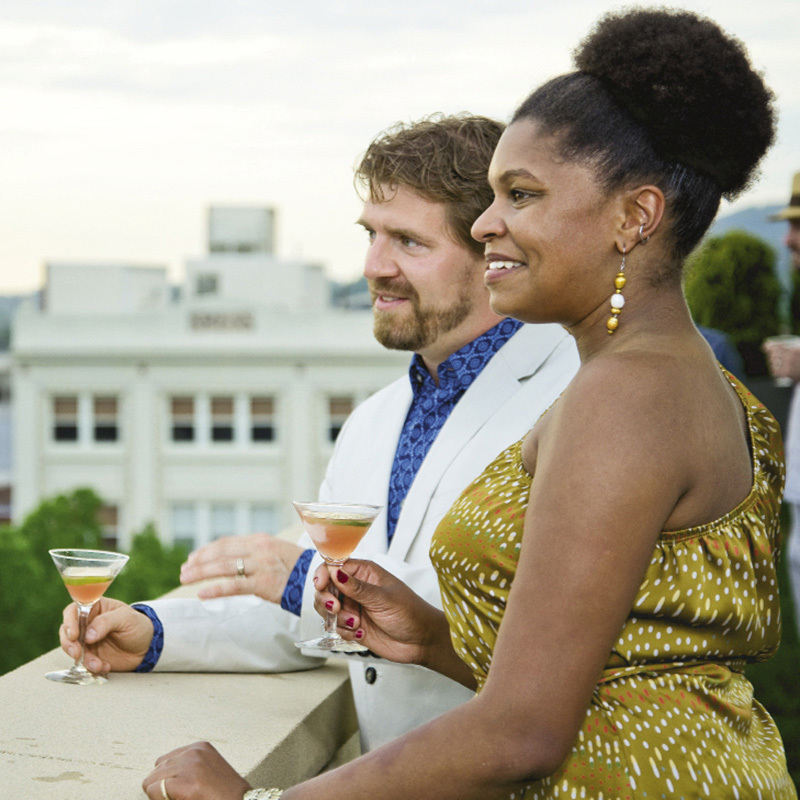 Star-tender Kala Brooks, curator of Top of the Monk on Patton Avenue and a cocktail blogger, hit the high notes with her rooftop surprise. Possibly one of the most work-intensive libations—with a shrub that had to be created a week before and stored in the dark—the beverage was beautifully curated with matching edible nasturtium blossoms, twists of citrus, translucent slices of fruit, and candied kumquats. The amber-hued liquid was floral and sweet, but not unctuously so, given the addition of grapefruit and gin and the vinegar-based shrub that brought balance. She also created a blueberry-chipotle version as well. Rather than boiling away the flavor of the herbaceous or fruit components in making a typical simple syrup, “a shrub naturally dissolves into a beautiful raw taste,” Brooks explains. Top of the Monk is primarily a speakeasy-style bar, creating Prohibition-era recipes. But Brooks is ever the experimenter. Charlie Hodge, owner of Sovereign Remedies on Market Street, is king of foraged and farm-to-glass cocktails. For this party, he charged one of his creative bartenders, Katey Ryder, with the task of creating an out-of-the-box beverage that would still be in keeping with his philosophy. And what could be more fun than liquor on a stick? Ryder delivered a trio of full-flavored cocktails in a nostalgic package. Mountain Bee is a sweet bourbon-honey-laced Popsicle that gets a grassy punch from spruce oil and spruce fronds. Southside Fizz has a bracing, fresh gin and tonic sparkle with juniper, while Daydream—the prettiest of them all—employs dried lavender from the garden, local Carriage House Apple Brandy, and a dose of milk to create a celestial hue. Liquor-based ice pops, push-up styles in particular, are a big trend for weddings this season, but Hodge and Ryder simply think they are a fun and unique way to transport the flavor profiles for which Sovereign Remedies is known. The den mother of this affair, Mary Rich, knows how to end on the perfect note. Rich’s Riveting Rosey is a shaken cocktail, a gossamer concoction that’s light and citrusy, with a fresh undertone of mint and a sensual flourish of rosewater to be inhaled before tasting. A voluptuous deep-pink rose petal floats atop the egg-white frothed liquid in an elegant etched coupe. A spectacular sunset closes out the evening, leaving the guests glowing and armed with new knowledge about creating the best cocktails of the summer. • Consider a theme for your party—it engages the guests before and during the event. • Create atmosphere with blooming plants or flowers, candles, and twinkle-lights. • Create a simple menu of the featured cocktails with creative names to set out on the bar. • Use only fresh juices, which can be prepped ahead of time. • Be sure to offer mocktails to your nondrinking guests; they want to be holding a beautiful creation as well. • Nervous about your frozen cocktails melting too fast? Dry ice is the key. Grab a cooler full from your local grocery, but beware: Don’t let it touch your skin, and use in a ventilated area. • Want large ice cubes? You can buy oversized ice cube molds or make your own. Freeze a loaf pan full of water. Release with warm water and place ice block on top of a towel on the counter. Use an ice pick and mallet to break into preferred sizes and shapes.